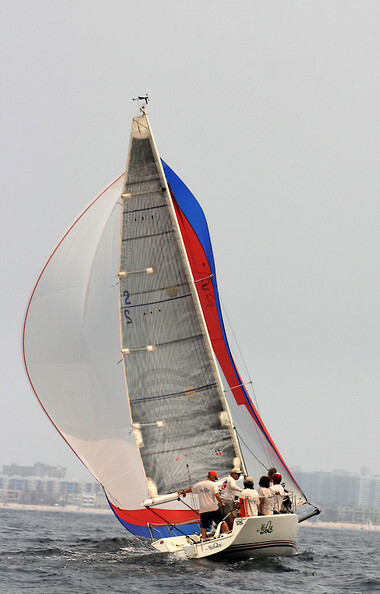 We’d never done the outlaw race (MDR toAlamitos Bay) on MisQue, our C&C SR25. Its about 30 mi. around PV and across Cabrillo and Long Beach, finishing in Alamitos bay. It’s always a beautiful sail around PV and the spinnaker run to the finish is always fun; challenging if there’s a really big blow. There was a separate Sport Boat Fleet with a huge rating range. That usually favors the faster boats. So we were a bit dubious about that. We did the math and the two 35 foot boats in our class would owe us 45 mins. We figured if the weather was just right (not enough for the big boats to break free & begin to plane) we would have a chance. So we signed up, gathered the “A” team and went for it. It was a close reaching start and we stayed “cracked off” for speed while others in our class headed up to a hard beat. A Mini Transat headed way low w/no chance of making the mark w/o tacking. our luck held with a usually well sailed J80 being late for the start. So we were off and once around PV point, running. As the faster boats closed on PV10, they all got headed and had to tack onto port to make that mark.